A grand daughter wants a baby quilt made with grey and white half square triangles. Does any one know of a quilt top that is made totally with these half square triangles? A Chevron quilt pattern may be the answer. Grey and white zig zags would look cool. just make a bunch of gray and white hst's then play with laying them out. once you have a pattern you like just sew them together in rows. there are many options and this is one of the ways to make this a learning experience too. Be sure to use many different grays and whites to give the simple quilt some textural interest. It'll be quite pretty! Would this work for you in different shades of grey? i found a free half triangle pattern for free but have no idea where I got it, very easy with charm squares, sorry I'm no more help than that , if I can find it I can fax it to you. But the one above is much prettier. I agree with pdcakm. Make some HSTs and just play. 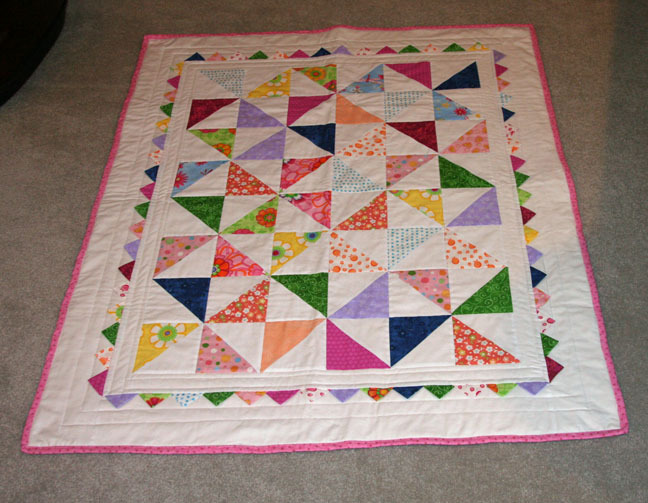 For inspiration, this lovely quilt was just posted yesterday: http://www.quiltingboard.com/picture...t-t224361.html Each block is an arrangement of HSTs. Pick one you like! Making a bunch and playing with them sounds like fun, and you can develop whatever style you like. But with a search I found this link that does show many possibilities.